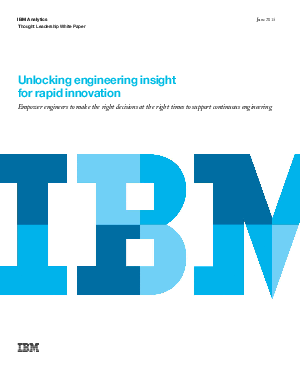 This white paper focuses on the value of unlocking engineering insight. It discusses ways for your engineering teams to work together to make the right decisions at the right times—and turn insights into business outcomes. In this paper, you will learn how a key enabler to this practice is the ability to have universal access to engineering information, regardless of where that information is physically located, or what tools store and manage it. And you’ll learn how IBM solutions can help put the practice to work within your own organization.